•	The Ugly Sweater 5K and Merry Fun Run / Walk Mile are part of the Very Merry Falmouth weekend celebration with many events on Friday and Saturday. The 5K is at 9 AM and the Fun Run / Walk is at 10 AM. •	The venue is located on the green space near Shaws Supermarket next to Route 1. The start and finish lines are next to the green space. •	Bib pick up and race day registration is in the tent on the green space. •	Refreshments will be available to runners and walkers after each event. •	Parking will be available in the outer lots next to Route 1 keeping spaces available closer to Shaws for their customers. •	Directions – The green space at Shaws on Rt 1 is near the intersection with Bucknam Road. Those coming from outside Falmouth can take exit 10 of Rt 295. •	Registration fee includes t-shirt if one registers before November 15. The fee is $30.00. Walkers are strongly discouraged from entering this event. The Fun Run / Walk is intended for any walkers. •	Course – Rt 1 south to Rt 88. 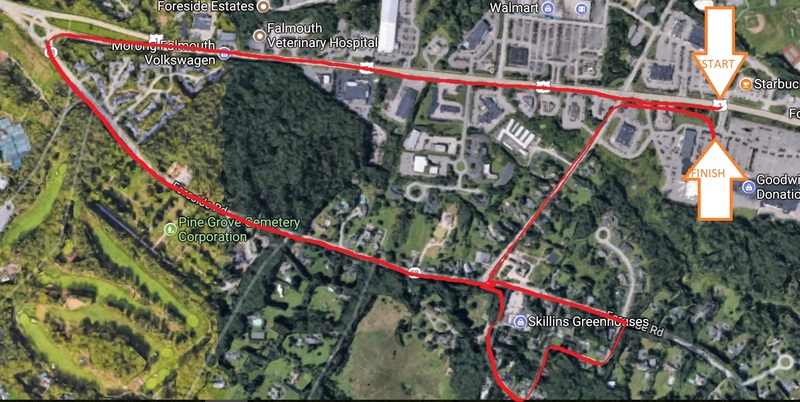 North to Old Mill, turn right, left on to Edgewater, right on to Anderson, left on to Ridgeway, left on to Rt 88, right on to Depot, right on to pedestrian way along Rt 1, right on to Shaws entrance to finish line. •	Awards – First place male and female plus first place of each 10 year age group; 5K runners with Ugly Sweaters also eligible for first, second or third place awards for ugliest sweatshirt. •	T-Shirts are available to runners who sign up by November 24. •	Registration fee is free with ugly sweater. Donations are encouraged to support the Falmouth Library. The suggested amount is $15.00. T-shirts are available at extra cost. Runners and walkers will not be timed. This is an event to show off one’s ugly sweater and parade along Rt 1. •	Course is down and back along the pedestrian way next to Rt 1. •	Awards – First, second and third place awards will be given to the ugliest sweaters as voted by runners, walkers and spectators. 5K runners can participate. I know that running [volunteering for] a road race is potentially hazardous activity, which could cause injury or death. I will not enter and participate unless I am medically able and properly trained, and by my signature, I certify that I am medically able to perform this event, and am in good health, and I am properly trained. I agree to abide by any decision of a race official relative to any aspect of my participation in this event, including the right of any official to deny or suspend my participation for any reason whatsoever. I attest that I have read the rules of the race and agree to abide by them. I assume all risks associated with running in this event, including but no limited to: falls, contact with other participants, the effects of the weather, including high heat and/or humidity, traffic and the conditions of the road [insert any specific risks related to your here, e.g. “the alligators who bask in the sun at the corner of 4th and Sunset St…”’], all such risks being known and appreciated by me. I understand that bicycles, skateboards, baby joggers, roller skates or roller blades, animals, and personal music players are not allowed in the race and I will abide by all race rules. Having read this waiver and knowing these facts and inconsideration of your accepting my entry, I, for myself and anyone entitled to act on my behalf, waive and release the Ugly Sweater Fun Run, the city of Falmouth, ME and the Road Runners Club of America, all event sponsors, their representatives and successors from all claims or liabilities of any kind arising out of my participation in this event, even though that liability may arise out of negligence or carelessness on the part of the persons named in this waiver. I grant permission to all of the foregoing to use my photographs, motion pictures, recordings or any other record of this event for any legitimate purpose.